Esmeralda Lambert has been on a mission since 2013 to meet growing consumer demand for ethically handmade jewelry..
Esmeralda Lambert has been on a mission since 2013 to meet growing consumer demand for ethically handmade jewelry and accessories, while empowering women artisans in her home country, the Dominican Republic. She has incorporated gems like turquoise and coral into her designs, but they came from other countries and not the rich supply of gorgeous natural materials in the Dominican. So, she went to work over the past few years to build relationships to source native gems like Amber and Larimar (only found in the Dominican) to bring more transparency in supply from handcrafters to end consumers and increase impact to her beloved artisan community. We are happy to announce that this Spring you can take home a piece of the beautiful Caribbean in Esmeralda’s newest line! 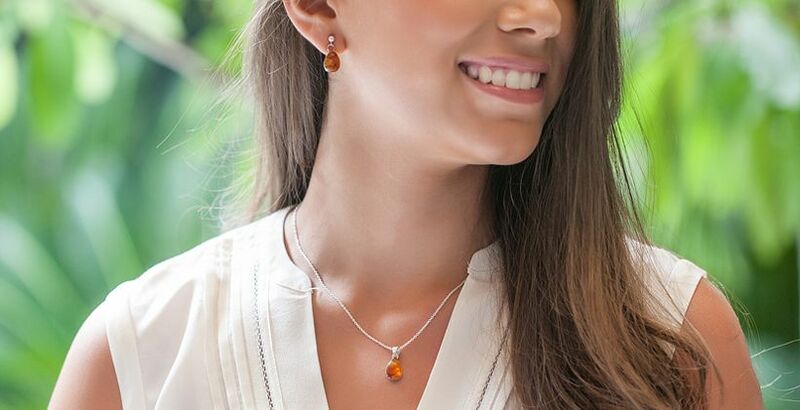 Esmeralda’s Natural Dominican Amber Jewelry Collection is set in sterling silver and designs range from ball, tear drop and raw oval in stud and drop earrings and pendant necklaces in small, medium and large sizes. All set in hand poured sterling silver findings and necklace chains. Amber (or ambar) is not actually a crystal or stone, it is a fossilized resin. It has beautiful sunny colors ranging from fluorescent yellow-orange-brown tones, although a rare blue tone exists in the Dominican. It often has inclusions from the fossilization process, which add character and uniqueness to each piece. As Esmeralda’s husband Matt says, Amber is similar to New England maple syrup as it comes in light, medium, dark grade colors. It is pretty true as they are both from trees! In alternative healing, Amber is believed to have purifying properties and protects from and absorbs negative energies and transforms them into positive energy. To see more of the new Natural Dominican Collection shop online @ www.EsmeraldaStore.com/search/ambar or Esmeralda store @ 54 Church, Street, Harvard Square, Cambridge, MA. Esmeralda came to the US in 2010 and graduated at the Babson MBA program where she met her now husband Matt. They cofounded the ESMERALDA LAMBERT business and have grown Esmeralda’s original signature handwoven statement jewelry style to be carried in over 40 stores in 4 states while expanding to a team of 7 artisan women. They recently opened their 1st retail flagship store, ESMERALDA, in the heart of Harvard Square, Cambridge, MA where she supports not only her line, but also a hand picked selection of 15+ independent family business designers from the US and 9 countries who meet the criteria of handmade with social responsibility. As the company grows they continue to shed light on unique ethically handmade fashion while supporting more artisans and family businesses in the Dominican, the USA and around the world.